Is Southern California Finally Getting Serious About Its Water Crisis? 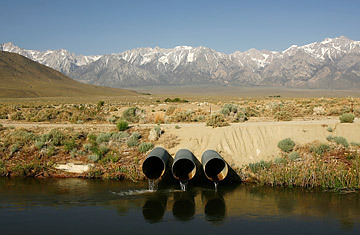 The Los Angeles Aqueduct carries water from the Sierra Nevada Mountains, seen here with less snow than normal, to major urban areas of Southern California on May 9, 2008, near Lone Pine, Calif.
To quench the thirst of Southern California's some 20 million people, water must be imported from hundreds of miles away, across a daunting array of deserts, valleys and mountains. For decades, Angelenos have muttered a doomsday refrain: our water supply isn't sustainable, and we are going to have to get smarter about managing it  at some point. The obviousness of the problem, however, instilled a kind of panicked lassitude. The discussion became predictable: alarm would set in during times of drought, as authorities talked of restrictions and plans to boost local water sources. Then rainy years would follow, and L.A. and its surrounding cities would move on to other, supposedly more pressing issues. Through it all, the mentality remained the same: sprinklers outside city buildings and private homes continued to feed large lawns even while it was raining, using water brought from far away. Now authorities are once again saying the time has come for a change. They say they're going to follow through. Should we believe them? Maybe. Simply because Southern California may no longer have a choice but to stop its lavish ways. Sometime in January, authorities will again limit the amount of water that the California Aqueduct transports from northern mountains and substitute it with water from reservoirs. That's been happening in the winter and spring seasons ever since environmental protections imposed limits on water that passes through the SacramentoSan Joaquin delta in a bid to protect endangered smelt. The measures are designed to protect the fish from being drawn into large pumps and killed when the State Water Project pumps water at high volumes. Conservation groups and fishing groups have championed the measures ever since a judge put them in place four years ago. But the protections are a huge point of contention for local water agencies and farmers who have lost their water supply. Both have launched a series of legal challenges that haven't prevailed. "We've been in court nonstop since 2006 on these biological opinions  with either environmental groups suing, saying they're not strict enough, or us suing, saying they're too strict," says Jeffrey Kightlinger, general manager for the Metropolitan Water District of Southern California. Southern California water officials have reason to be nervous. Dependence on imported water sources enabled Los Angeles to grow into the metropolis it is today. About half of Southern California's supply is still brought in from the delta and the Colorado River. The region spent the past decade dealing with a decrease in its share of Colorado River water. Now authorities say the smelt protection measures are costing the region about one-quarter of the water it imports from the delta, driving up rates for an ever growing population. "It has really cut into the reliability of our imported water supply," Kightlinger says. This year water isn't as much of a concern because the state has received a lot of rain and reservoirs are full. But in a drought  one gripped California at the end of the last decade and is likely to return  the issue of delta water becomes a battleground. "Now we're in a situation where we have to make some serious trade-offs between protecting the environment and providing water," says David Ginsburg, professor of environmental studies at the University of Southern California. "You can't have your cake and eat it too. I don't think it's sustainable." Some environmentalists are suspicious of any promises to move in the direction of self-sufficiency. They cite official figures that 54% of single-family home water is still used outdoors. They're urging Californians to do more to collect rainwater and substitute their green lawns with native plant species that are more drought-friendly. Emily Green, who blogs and writes a column about garden conservation for the Los Angeles Times, has urged officials to plant native species such as sycamores, lilacs or Engelmann oaks outside city hall after the tent city installed by Occupy Los Angeles destroyed its lawn. "From the time the big water projects were built, L.A. was really hardwired to grow on imported water. That was the game plan," Green said in an interview. "The mind-set is changing, but it's changing very slowly." Others, however, are impressed with the progress the region is making. Officials point out that 20 years ago, about two-thirds of its water was imported; today it's down to half. Total retail water demand in the region has also fallen from just under 4 million acre feet in fiscal year 198990 to 3.35 million acre feet in 201011, according to the Metropolitan Water District of Southern California. To further increase local supply  which is much cheaper than imported water  authorities are investing in water-recycling plants to capture more storm water before drains flush it into the ocean; they also plan to clean up contamination so more groundwater can be used. And they're putting more emphasis on conservation efforts, which helped water-use levels in the city of L.A. hit the lowest levels since the 1970s last year, according to the Department of Water and Power. The city has implemented a mandatory water-conservation program that includes measures like restricting sprinkler watering to two days a week. "There's a bit of a paradigm shift going on now," says Doug Obegi, an attorney with the Natural Resources Defense Council who focuses on water issues. "The old paradigm was to take more water out of our rivers and out of the delta. The new one is to invest in regional and local supplies and be smarter about using water. It's hard to see all those little incremental changes making Southern California less reliant on the delta, but it is happening." Is it happening fast enough? The next drought will most likely provide the answer. See TIME's Person of the Year 2011. See the Top 10 Everything of 2011.